Complete dentures consist of an acrylic base to imitate gum tissue, and the teeth that can be made of acrylic or porcelain. 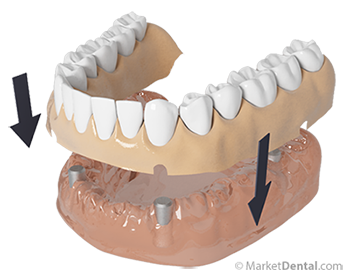 The denture base is made to closely fit the contours of the arch to ensure the denture is as stable as possible during normal oral functions such as eating, speaking, or swallowing. While a lot of people are happy with their dentures, due to large anatomical variations, some will never feel totally satisfied. Lately however, solutions have been developed to improve the functionality and comfort by supplementing dentures with dental implants. If you are having a hard time with your existing dentures, book a consultation with Dr. Marius Caragea , to discuss your options.